Imagine you’re at a party. You’re visiting with a small group of people. Both men and women. Someone makes the comment that there are a lot of things they look for in a partner, but one of them is a good sense of humor. Who nods in agreement? The men? The women? Both? Across the board, men and women agree. A good sense of humor is VERY important. In other words, men are looking for someone who sees them the way they want to see themselves. It’s part of what we men look for in a partner. Someone who validates the version of ourselves we want to be. In this case, the provider of entertainment. Sure, we could focus on the difference between guys and girls in this specific scenario, but I’m inclined to point out something more profound. All of us, men and women, use our partners as mirrors. We see ourselves through our partner’s eyes. In some ways, that’s a good thing. Assuming your man admires, respects, and appreciates you, leaning on his opinion should boost your self-esteem. But there’s a downside, too. It’s not good to be too caught up in how he sees you. When you are, your self-esteem becomes dependent on something OUTSIDE your control. Namely, someone else’s assessment of you. You can’t get away from seeing yourself through his eyes, and you shouldn’t try to. Naturally, you’re going to put stock in what your partner thinks of you. Fortunately, there’s a way to take his opinion of you seriously without losing your sense of self. I suggest sticking to the following two tips to create a balanced self-image. Take the good and the bad. When he tells you he likes something about you, it makes you feel good. And guess what? It should! Enjoy those ego strokes. By contract, it’s not as much fun when he’s critical. Part of the challenge here is to learn to accept both positive and negative feedback from your partner. Revel in those moments when he affirms you. When he makes you aware of something you could work on, accept the feedback with grace and tenacity. Make YOUR assessment of yourself the foundation of your self-image. As important as his opinion is, your self-worth shouldn’t depend entirely on what he thinks. The foundation of your self-esteem should come from WITHIN. That’s where real confidence starts. So if you’re not already in the habit of telling yourself why you’re awesome, start doing that NOW. Think about the things that make you unique, beautiful, fun to be around, and special. He’s with you because you’re a catch. But try to anchor your self-esteem in your own positive assessment of yourself. All of us rely on the people around us to better our understanding of ourselves. We see ourselves through our partner’s eyes. Learn how to balance his opinion of you with a deep internal sense of confidence. 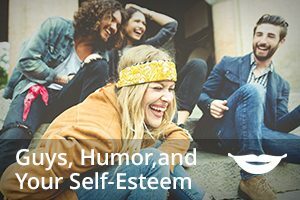 Root your self-esteem in what YOU like about yourself, even as you enjoy his compliments and grow from his critical feedback. [i] Bressler, Eric R., Rod A. Martin, and Sigal Balshine. “Production and Appreciation of Humor as Sexually Selected Traits.” Evolution and Human Behavior 27.2 (2006): 121-30. Web. [ii] Zietsch, Brendan. “How Do We Choose a Partner?” The Conversation. The Conversation US, Inc., 26 May 2016. Web. 16 June 2016. This entry was posted in How To, Self Help, Self Improvement by James Bauer. Bookmark the permalink. What will I receive when I oder ? Hi Martina. I primarily offer courses in digital format (mp3 to download, or a video if it’s a mini-course, or an e-book). My only physical book course so far is What Men Secretly Want. James, thank you for yet another profound, informative post! I just love it how you base your articles on solid, real research!